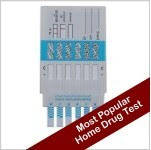 Home Drug Test: Why Choose A Home Test for Nicotine? Why Choose A Home Test for Nicotine? The home nicotine test is an important tool for parents, relatives, and prospective employees these days. On one hand, parents may be scared of data collected by the Centers for Disease Control and Prevention that suggest nearly 25% of high school students smoke cigarettes and on top of that, another 8% use smokeless tobacco. On the other hand, prospective employees increasingly have to face the reality of work-related nicotine tests. As a matter of fact, a recent court ruling supported the right of companies to use nicotine testing as an employee screen. You can read about this recent news story involving Scott Rodrigues and lawn care company Scotts Co. here at the Boston Globe. Companies can require a urine test to prove you are a non-smoker before they hire you. It's clear then that there are many reasons one might want to purchase a home tobacco test. The good news is that they are accurate and easy to use. Home Health Testing provides a home nicotine test which you can learn more about here http://www.homehealthtesting.com/home-tobacco-test-p-80.html. It is a urine drug test that can tell you in only five minutes if any product with nicotine has been used in the past 2-4 days. In our world, knowing whether someone smokes can be extremely important. Finding out this information does not have to be difficult though. You can purchase an easy to use nicotine test from Home Health Testing here today. Click here to view the product information page.